Miracle at the Forks: The Museum that Dares Make a Difference, which chronicles the 14-year journey to plan, build and open the Canadian Museum of Human Rights (CMHR), was launched on Sept. 22 at the museum with Gail Asper, Moe Levi, Stuart Murray, and co-authors Peter C. Newman and Allan Levine. The 200-page book, released by Figure 1 Publishing, officially hit the bookstands on Sept. 23. She continued, “We started on this journey to find a way to educate our youth about our human rights violations that occurred in our history and to inspire people to take action. This has been a long, often challenging, and many times miraculous journey from dream to reality. That’s why we’re thrilled that non-fiction writers Peter C. Newman and Allan Levine are here and have written a compelling book, recounting the story from the day Dad – Israel (Izzy) Asper – dreamed of a centre for human rights and gave Moe Levi the mandate to make it happen, to the completion of the building this year. Newman described the book’s overarching purpose. “Canada was built on dreams as well as appetites. This country was founded by waves of immigrants with big ideas and big dreams. The [Canadian] Museum of Human Rights will dramatically alter Winnipeg’s skyline. But its name is a misnomer; museum is too limiting a description. That’s a venue people visit to remind one another of past lives … memories that can light up a rainy Sunday afternoon. Co-author Levine said, “I was fortunate to spend a lot of time with Izzy Asper and listen to him talk…. He told me often, one of the secrets of success came down to perseverance. He just never gave up on anything he did. Levine read aloud excerpts from the book’s section “A Magnificent Conception,” about the delay in getting the museum off the ground. “You see, Asper was not a journey-to-the-destination type of person. He was a just-get-to-the-destination kind of guy. So, if you’d told him in 2003, prior to his death, that more than a decade later the Museum for Human Rights would not be open, he would have been appalled. “Back in 2000, once the initial idea of the Museum of Tolerance, as it was first referred to, began to germinate, and after Asper had found a spot at the Forks where he wanted to build it, plans advanced methodically and purposefully. “Asper’s vision, although not clearly articulated initially, was to establish a museum that would teach the lessons of the Holocaust as well as examine human rights in a Canadian context against the backdrop of the Charter of Rights and Freedoms. There was a part of Canada’s history that had never been told, and he spoke really with as much passion about the Holocaust as he did about the Japanese, Chinese and Aboriginal societies, in particular. “The project Asper envisioned was unique for several other reasons, factors that would prove a stumbling block difficult to hurdle, the grandeur of the museum Asper had in mind was akin to the Guggenheim Museum in Spain. “One misconception that stands out is how people believe that he intended this to be a private museum … the opposite is true. Right from the beginning, he stated that he only wanted to spearhead this project, not run it or control the agenda. “In the early years, Asper had underestimated the opposition he was to face from just about every corner – skeptical politicians who questioned the need for such a mammoth and expensive museum, academics and journalists who did not believe the museum of human rights could be done properly, or whether it was even necessary. “Ottawa bureaucrats protested loudly about placing a national rights museum anywhere but in Ottawa, and a collection of naysayers who questioned the use of the Asper Foundation’s use of tax-payer money as part of an alleged scheme to advance so-called Jewish interests. When finished reading the first book excerpt, Levine shared, “Izzy, by the way, dictated things. Gail was instructed by her father that she was to dedicate half her day, every day, to the museum. “So this, I quote, from Izzy’s letter to his daughter: ‘You must get up and end every day and ask yourself, what did I achieve in finding 60 million needed from the private sector for the museum? You are not to take any calls, answer any letters, or have any meetings with people who are seeking donations from the Asper Foundation. That is Moe’s job, and not to be duplicated. ‘I’m spelling all of this out because this is your opportunity to prove that you can act like a senior executive, and not to be distracted by everything that happens to go by. I hope you can exercise for us and discipline the outlined above. 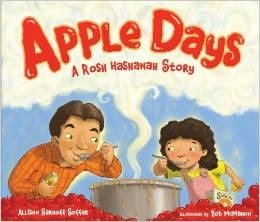 In Apple Days: A Rosh Hashanah Story by Allison Sarnoff Soffer (Kar-Ben Publishing, 2014), Katy and her classmates share what they like best about Rosh Hashanah with their teacher. Katy recalls how each year she and her mom go apple picking, return home, and then Katy helps her mom make applesauce. This year’s day goes on the calendar, and it seems like the whole community is looking forward to it, when a family “crisis” arises. Soon the word spreads that apple-picking day is not going to happen but, soon enough, friends, community members and Katy’s father become involved, leading to a happy ending for all. 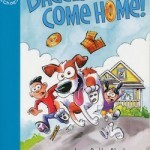 This book for children ages 2 to 7 is not only fun to read but it teaches important lessons about what happens when a family has to have flexibility and what can happen when you share your problems with your friends and community for support. Sarnoff Soffer teaches at a preschool school in Chevy Chase, Md., where she lives with her husband and children. This is her first book. Illustrator Bob McMahon provides cartoon-like, colorful drawings. A recipe for applesauce is included. Sybil Kaplan is a foreign correspondent, lecturer, book reviewer and food writer in Jerusalem. She has compiled nine kosher cookbooks. She leads weekly walks in English in the Jewish produce market, Machaneh Yehudah, and writes the restaurant features for Janglo, the oldest, largest website in Israel for English-speakers. Rosh Hashanah and Yom Kippur are nearly here! A memorable way to include some special inspiration for you and your children is to drop into the Isaac Waldman Jewish Public Library, where you’ll find a great variety of books perfect for both celebrating both of the High Holidays. Here are just a few of the new children’s books that you can find on loan. What a Way to Start a New Year! 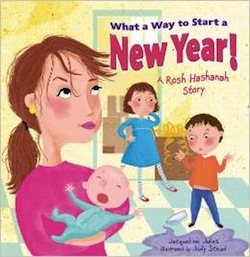 A Rosh Hashanah Story. The complexities of both family and relating to a new community are thoughtfully explored in story of Dina and her family moving to a new city via the great value and resilience of tradition renewed in the High Holidays. Dina’s family life is expressively and colorfully illustrated by Judy Stead. I’m Sorry Grover: A Rosh Hashanah Tale. Part of the enduring Shalom Sesame series, this is a delightful introduction to all the important aspects of Rosh Hashanah. Dear old Grover tells the funny adventure of Brosh, who has misplaced his favorite blue, woolly hat. In his search, his doubts are resolved and confidence and New Year happiness restored. Apple Days: A Rosh Hashanah Story. Every year, in preparation for the holiday, Katy and her mom pick enough apples to make their special sauce. But this year brings the birth of a new baby cousin for Katy, so, apple picking is off. Not to worry, the family’s friends and neighbors come to the rescue. Dynamic illustrations complete a story as fresh and crisp as a first, sweet autumn apple. The library has dozens of other books on the High Holidays, including the Sammy Spider’s First Series that are very popular with preschoolers, as well as lots of board books for babies and toddlers. Take the books home or read in the library. 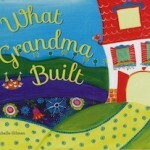 Babas and Zaydas can drop in with their grandchildren, who can choose their favorite holiday story. To see a complete list of library books, check out the library catalogue at jcclibrary.ca. 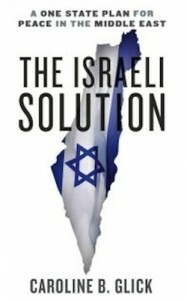 The two-state solution was one of the most talked about issues in the conflict between Israelis and Palestinians. Not everyone is talking about a two-state solution these days, however. As a regular reader of Jerusalem Post columnist Caroline Glick, I was interested to read her most recent book, The Israeli Solution (Crown Forum, 2014), in which she introduces her vision of a one-state plan, and challenges the assumptions two-staters make about the demographic threats that are supposed to be inherent in a one-state future. Glick also considers what might be the international response to such a plan, as well as the risks and benefits to all the players. She presents a history of Israel, then provides a look at both Yasser Arafat and current Palestinian Authority President Mahmoud Abbas, as well as reviews the history of Hamas. 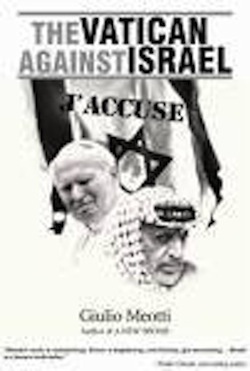 She states her incredulity that Western leaders acknowledge Hamas as a terrorist organization but fail to see that Hamas is the same as Arafat, Abbas and others who support terrorism and advance the cause of Israel’s destruction. Glick also discusses the origins of the often-confused term Palestina, which the Romans incorporated to wipe out the Jewish identity of the land of Israel because it connected the identity of the land to the ancient Philistines. In conclusion, she makes her points very clear that “the Palestinian conflict with Israel is a function of the larger Arab and Islamic world’s refusal to accept that Israel has a right to exist.” The Arab states exploit their politics and foreign policies as a means to coerce the Americans into taking actions to appease them, she argues. An extensive bibliography and notes closes the book. The Catholic Church did not initiate diplomatic relations with the state of Israel until 1993 and, according to the Italian writer Giulio Meotti, things haven’t been all rainbows since then either. 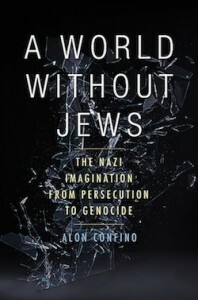 The creation of a thriving Jewish state creates a theological conundrum for the Catholic Church, Meotti writes in The Vatican Against Israel: J’Accuse (Mantua Books, 2013), because it is a refutation of the theological view that Judaism should wither and die in the shadow of a successor religion, Christianity. The theological imperative of Jewish disappearance is now accompanied, he writes, by a geopolitical imperative that Israel should vanish. Meotti contends that this process has involved the Catholic Church differentiating between “good” and “docile” Jews of the Diaspora and the “bad” and “arrogant” Jews of Israel. The first translation into Arabic of the Protocols of the Elders of Zion was courtesy of the Catholic Church. One archbishop was convicted of using his immunity to smuggle explosives to Palestinian terrorists and served just four years of his 12-year term after intervention by the Pope and a promise to make no more trouble. (He turned up again in 2010 on the fatal “Freedom Flotilla” that sought to bring aid to Hamas terrorists and has goaded Palestinian Christians to violence, insisting it is the only thing that will move Israelis.) Today, Catholic-affiliated nongovernmental organizations are among the leaders in the anti-Israel boycott, divestment and sanctions movement. The Vatican’s relationship to the Holocaust is particularly dissolute. Pope John Paul II, in 1979, spoke at Auschwitz, noting that “six million Poles lost their lives during the Second World War, one-fifth of the nation,” failing to note that these were almost all Jews. Instead, he called Auschwitz “the Golgotha of the contemporary world,” Golgotha being the place in Jerusalem where Jesus is said to have been crucified. John Paul also infuriated Jews, among others, by conferring a papal knighthood on Kurt Waldheim, the former Austrian president, United Nations secretary-general and Nazi war criminal. The “J’Accuse” part, which channels the moral outrage of Emile Zola, is fair enough, but this book is only partly about the Vatican. Meotti dredges up equally egregious affronts perpetrated by countless other Christian denominations. The book is a searing indictment of the Catholic Church, but it is also deeply flawed. At the least, the title is deceptive. The “J’Accuse” part, which channels the moral outrage of Emile Zola, is fair enough, but this book is only partly about the Vatican. Meotti dredges up equally egregious affronts perpetrated by countless other Christian denominations. By no means is Meotti’s condemnation limited to the Vatican, and it is difficult to discern why the title should suggest it is. Meotti frequently puts uncited statements in quotations. For example, during the 1967 war, when Israel faced annihilation from the Arab states, Meotti claims the Vatican gave the order: “Cheer for the other side.” The quote marks suggest someone literally said this, but whom? On another occasion, he attributes, in quotes, the statement “Jerusalem must be Judenrein.” But who is alleged to have said it? One can also frequently sense comments being stretched out of context to fit the thesis. Too many times to count, Meotti declares one Christian assertion or another “a blood libel.” The term’s over-usage diminishes whatever power the accusation carries. And nowhere is his over-usage more disturbing than in his casual, often flippant invocation of Nazism. Meotti’s book has the potential to make an important case against Christian antisemitism and anti-Zionism. While it doesn’t fail completely – the evidence being compendious – the charge to the jury is so overwrought that one feels resentful at being manipulated. The facts would speak for themselves if the author would step back a bit. Jews are the quintessential successful minority group by any economic measure. They are disproportionately represented in the top rankings in business, finance, the arts, scientific research, architecture, medicine and law. Likewise, Mormons and new immigrants to the United States from China, Cuba, India, Lebanon, Nigeria and Iran make the A-list in several sectors of the economy. Meanwhile, black Americans and other groups are stuck in poverty with high unemployment and poor education. Those are bold statements that many will dismiss as thoughtless stereotypes. But are the generalizations baseless? 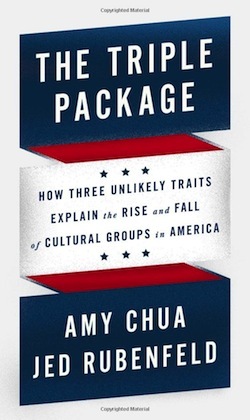 The Triple Package: How Three Unlikely Traits Explain the Rise and Fall of Cultural Groups in America (Penguin Press, 2014) is an exploration into the murky world of these sweeping statements. Amy Chua, the “tiger mom” who gained notoriety for her harsh approach to child-rearing, teams up with her accomplished husband Jed Rubenfeld to investigate some of the reasons why some groups rise to the top of their fields, become wealthy and win awards while others seem to be stuck in a rut. They look for similarities in the lives of numerous celebrities, corporate leaders and ordinary folks, both those who have done well and those who have failed. They dissect statistics from census tracks that identify highest income and medium household net worth for different ages within several racial, cultural and religious groups. They count CEOs and CFOs, the percentage of students at Harvard and other Ivy League schools, and the winners of Nobel Prizes, as well as cultural awards such as Pulitzers and Academy Awards. They slice and dice the numbers in numerous ways and come out with specific cultural traits – a set of values and beliefs, habits and practices – that they conclude are similar among all the overachieving groups. • Disproportionately successful groups have a deeply internalized belief in the specialness or superiority of their group, rooted in theology, history or a social hierarchy from their homeland. • Members of the group have a feeling of insecurity and anxiety about losing whatever they have. They feel what they do is never good enough. • Those that succeed emphasize discipline and controlling impulses. They stand up to temptation and persevere despite difficulties. The authors conclude that people grappling with a superiority complex and deep insecurities are often consumed with resentments that push them to overachieve. The chip-on-the-shoulder attitude feeds their ambition and creates an “I’ll show them” mentality. Impulse control mixed with strong ambition yields a toughness and resilience. Members of the group who succeed found virtue in enduring hardships, deferring gratification and standing up to adversity. There is some truth in what they write. The biographies of prominent Jewish figures often include anecdotes reflecting those traits. Although Jews are “Chosen People,” they are haunted, at least in the world of Philip Roth and Woody Allen, by insecurities stemming from unrelenting parental pressure and social scorn, real and imagined. Impulse control has been foundational to Judaism religion, with its 613 injunctions, and its countless prescriptions for a traditional Jewish way of life. It is those forces that Chua and Rubenfeld say converge to produce success. Jewish overachievers are not the only ones. Chua and Rubenfeld find parallels with the traits of the disproportionate number of Mormons who are top executives of Fortune 500 companies, with Asian American students with the highest grades (but reportedly the lowest self-esteem of any racial group), and Cubans in Miami who have become millionaires and hold a disproportionate number of managerial and professional positions in the city, and dominate local politics. Other immigrant groups under similar pressures also do well. But such sweeping statements set off alarms. Caustic reviews since the book was released earlier this year dismissed their conclusions as racist, faulty social science and, some may say even worse, dull prose. Reviewers attacked Chua and Rubenfeld, two Yale University law professors, for sloppy thinking and loose use of language. Chua and Rubenfeld are accustomed to public attention, although usually of a different sort. Chua was on Time magazine’s list of the 100 most influential people in the world after the release of her book Battle Hymn of the Tiger Mother in 2011. Rubenfeld has written two international bestselling novels and two books on constitutional law. They challenge those who assume equality is always beneficial. They suggest that promoting self-esteem, instant gratification and excessive freedom in parenting may be counter-productive. Clearly frustrated by the response to their new book, Chua and Rubenfeld have said their work has been misunderstood and misrepresented. They believe they have been aggressively attacked because their conclusions run counter to contemporary political correctness. They challenge those who assume equality is always beneficial. They suggest that promoting self-esteem, instant gratification and excessive freedom in parenting may be counter-productive. They attribute the uproar over the book also to an aversion to talk about opinions about various cultural, ethnic and religious groups doing significantly better than others, views that are often expressed privately but not in a public forum. They got that right. It’s a minefield filled with explosive emotions and ugly name-calling. However, they are right in insisting that the overheated rhetoric contributes nothing to an understanding of the subject. We should not avoid discussion of hot issues, especially those that have given rise to some of the worst atrocities in the world. Chua and Rubenfeld raise matters that should engage society in dispassionate debate. So let’s turn the spotlight on their generalizations about cultural traits to see whether they stand up. Chua and Rubenfeld try to inoculate their conclusions from criticism with 78 pages of notes and listing the names of 50 research assistants who worked with them. They claim statements about economic performance and cultural attitudes are backed up by empirical, historical or sociological evidence. “But when there are differences between groups, we will come out and say so,” they write. They look at characteristics of those struggling in poverty and at a variety of explanations for their situation, such as IQ levels. They conclude that the disparities between rich and poor cannot be explained by these alternatives. They also note the transitory nature of the accomplishments achieved through the sense of superiority, insecurities and hard work. Success wipes out insecurity and eases assimilation; equality undermines personal ambition. They conclude that traits that helped disproportionately successful groups rarely survive beyond the first two generations. They downplay the impact of politics, social institutions and education. Personal responsibility plays virtually no role in their theories. Factors that have nothing to do with religion, culture or race, such as the lack of opportunity, discrimination and the devastating impact of economic forces, are minimized. Chua and Rubenfeld gloss over examples that do not fit their theories. Despite their extensive references to research, the book reads as if Chua and Rubenfeld started with conclusions and then went out to find evidence to back up what they wanted to say. Focusing on cultural traits has blinded them to other influences. They downplay the impact of politics, social institutions and education. Personal responsibility plays virtually no role in their theories. Factors that have nothing to do with religion, culture or race, such as the lack of opportunity, discrimination and the devastating impact of economic forces, are minimized. Chua and Rubenfeld gloss over examples that do not fit their theories. Are they cherry-picking results and leaving out conflicting evidence? An answer to that question will be left to the experts in the field. Anticipating probably the most controversial attack, the charge of racism, the authors write they are identifying psychological attitudes, not characteristics from birth. They acknowledge that significant differences exist within every racial, cultural and religious group. Even the subgroups they identify were not monolithic. But, they say, that did not make the culture traits less real or powerful. They also anticipate critics who say the traits they celebrate often do not lead to happiness. They acknowledge that the attributes of success come with their own distinctive pathology that misshaped lives. Deeply insecure people were often neurotic and a sense of superiority led to arrogance and easily morphed into racism. They concede that the “triple package” might not be a recipe for happiness. Indeed, the rewards of the triple package were mostly financial. However, they posit that material success can lay the foundation for a happier life. So, what are we left with after so many qualifications? 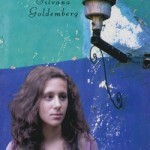 As pop sociology, the book provides numerous provocative sparks for conversation around the Shabbat table. They identify some traits of some people who have achieved much. But many would insist their glib generalizations are just plain wrong. At times, they seem to give the strongest arguments against their own conclusions. And, even if you accept what they say, it is doubtful that many parents would want their children to follow the direction that Chua and Rubenfeld have set out. Media consultant Robert Matas, a former Globe and Mail journalist, still reads books. The Triple Package: How Three Unlikely Traits Explain the Rise and Fall of Cultural Groups in America is available at the Isaac Waldman Jewish Public Library. To reserve this book, or any other, call 604-257-5181 or email [email protected]. 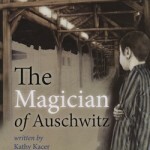 To view the catalogue, visit jccgv.com and click on Isaac Waldman Library. 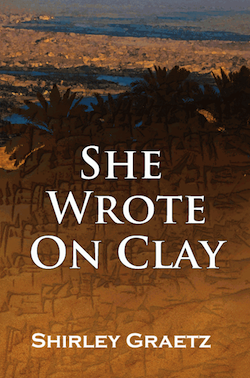 Shirley Graetz’s She Wrote on Clay (Hadley Rille Books, 2013) is so intriguing, so mesmerizing, so unique, so well-written, I could not put it down! Graetz was born in Dusseldorf, Germany. She came to study at the Hebrew University of Jerusalem and never left Israel. Her master’s degree and her doctorate are in ancient Near Eastern studies, and she is a licensed tour guide and a teacher, married and mother of three young children. She explains that, while conducting her PhD research at Ben-Gurion University in 2011, she was working on letters written by women who were naditu, monastic women who lived around 1800 BCE, about the time of Abraham, in Mesopotamia (ancient Iraq). The texts were originally in cuneiform on clay tablets, in Akkadian, an ancient language. Some of these women were scribes. They lived in the equivalent of a walled compound called a gagu, but each woman had her own house or room. They all came from wealthy families, and there were different gagus in different cities. By becoming a naditu, each woman foreswore marriage and children, but her family provided her with food and clothing. However, the women had to be successful in business in order to remain financially independent. The most prominent gagu was in Sippar, Meospotamia, a city on the banks of the Euphrates River, from which we have the most texts. 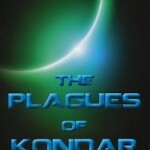 The novel revolves around 16-year-old Iltani, whose goal in life is to become a scribe. The best way to achieve this is to become a naditu and go to a gagu, which she will do in three months; her aunt and a childhood friend also live there. Her father has paid a naditu there to teach her to be a scribe. Once she enters, she will not visit her family for two years. When she enters, there is a ceremony as she leaves her family and is welcomed by the priests, the making of temple offerings and her initiation. Her life then begins, and this forms the bulk of the book – focusing on her day-to-day life, the process of learning to be a scribe, her relationships with her aunt and friend, as well as conflicts within the gagu and her other relationships, until she is 25, already nine years in the gagu. It was Aug. 9, 2001. I was in Jerusalem after 19 years absence, to attend a convention and do research on a memoir, Witness to History: Ten Years as a Woman Foreign Correspondent in Israel (still unpublished). I was staying at the Sheraton (now the Leonardo). I left the hotel to meet my good friend and personal guide, Pat (z”l). She and I were going to the Bible Lands Museum for a reunion with a mutual acquaintance. All the traffic from the hotel down King George into town was blocked. We heard there had been a terrorist attack, but decided to go on with our plans. Later, when we returned to the hotel, national board members were waiting for us and told us to go and call our families and tell them we were OK. One by one, Hadassah women came in with stories of having been on Ben Yehudah … of hearing an explosion and ambulances. It was the Sbarro restaurant terrorist attack. Dr. Zieva Dauber Konvisser is a fellow of the Institute for Social Innovation at Fielding Graduate University in California. 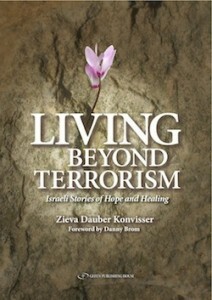 In 2003, she was at the Israel Centre for the Treatment of Psychotrauma in Jerusalem, beginning research on the “possibility of post-traumatic growth coexisting with post-traumatic stress.” Earlier this year, her book Living Beyond Terrorism (Gefen Publishing, 2014) was published. Konvisser is a second-generation Holocaust survivor, having lost more than 30 relatives in Vilna. During a trip to Israel in 2002, she reflected how survivors of terrorist bombings moved beyond their traumas. Subsequently, she visited Israel eight times between 2004 and 2010 to speak with such survivors. She spoke with 24 survivors in 2004, who made up the research study sample for her doctoral dissertation, then revisited them in 2007, interviewed seven more plus 15 Arab Israelis. In 2013, she again asked them to reflect upon and describe changes in “their family, work, health and/or outlook in life since the previous interviews. The result is 36 stories as told by 48 survivors and family members with 33 incidents described. Among the most amazing aspects of the book is one of the three appendices, which lists 58 organizations supporting terror survivors and families. There is also a glossary and a selected bibliography. 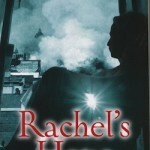 • They struggle, confront and ultimately integrate painful thoughts and emotions. • They adjust their future expectations to fit their new reality. • They call on their inner strength, core beliefs and values. • They are helped to move forward by strength gained from their past experiences and prior adversity. • They are helped by spirituality or grappling with fundamental existential questions. • They stay healthy and focus on their fitness level. • They are creative, find the silver lining and give back, moving forward with action. • They stay connected and seek outside resources to help them through rough times. • They tell their stories and try to make sense of their lives. • They are hopeful, optimistic and celebrate life. May we all learn from their experiences.